Put the peas into a pan with 4 tbsp water. Set over a high heat, cover and cook for 5 minutes or until defrosted and tender. Meanwhile, in a processor, whizz the bread with 2 tsp curry paste to make even crumbs. Spread over a plate. On another plate, mix together the yogurt and remaining curry paste. Dust each fish fillet with flour, coat in the yogurt, then the crumbs. 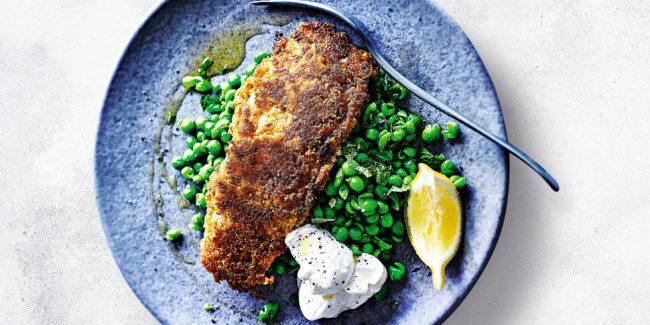 Heat the oil in a non-stick frying pan then cook for 2 minutes on each side, pressing the fish down occasionally with the fish slice as it fries. 3. Add the mint and a squeeze of lemon to the peas, mash to make a chunky purée, then season. Serve with the fish, a spoonful of yogurt and more lemon for squeezing.